Ch. 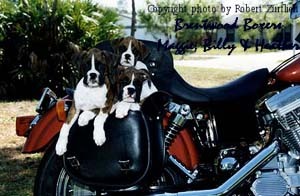 Brentwood's Moody Blues "Maggie"
Ch. 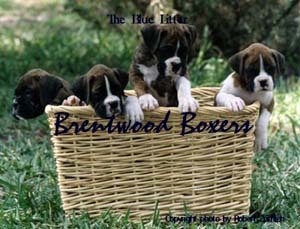 Brentwood's Rhythm 'n Blues "Billy"
Brentwood's Rhapsody in Blue "Heather"
The photo above, taken by Robert Zurflieh, shows five generations of boxers, beginning with Ch. Somerset's Lady Liberty (age 10 1/2) down to Brentwood's "Blue Litter"
(7 puppies shown at 6 weeks of age). 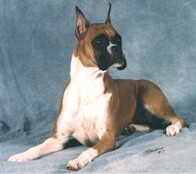 Having owned or bred nine boxers to date which have earned their obedience titles, temperament is a very important trait to be considered. 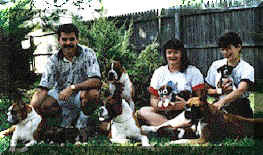 We are very proud of the following obedience boxers.